Unbelievable. Insane. Psychotic. Bizarre. What else do you call when a guy ‘rides’ the wave instead of ‘surfing’ the waves? Well. That’s exactly what Robbie Maddison did. He literally rode a dirt bike onto huge waves in Tahiti. Robbie Maddison is famous for stunts like jumping his bike over a football field and backflipping over the opened Tower Bridge in London, riding his bike across waves was his most ambitious stunt yet and took two years of preparation.But from the looks of it, it was well worth the two year prep. Because it looks SPECTACULAR. It is absolutely crazy. 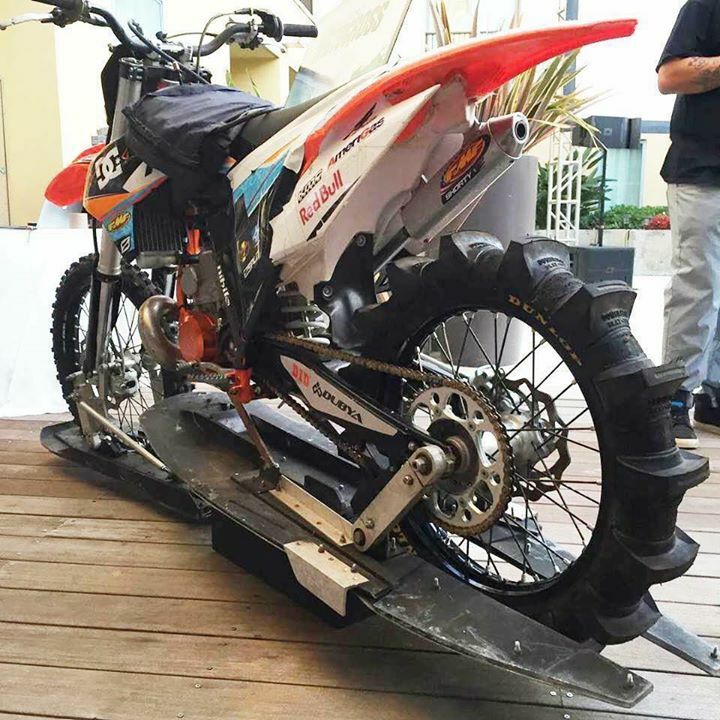 We can see that the front wheel has skis at the bottom to facilitate the forward movement. But this video has a tremendous shock value in all fairness. ‘Faad diya’ is what we would say in Hindi!!! And here is the KTM motorcycle without which this whole drama wouldn’t have been possible. Check the YouTube video here.